Try this amazing vegan breakfast recipe, Vegan Breakfast – Scrambled Tofu By Our Lizzy Cookery School. Ready in 5 minutes, easy and delicious. 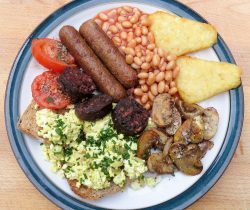 Add on some mushrooms, hash browns, vegan sausage and some of our Amazing Vegan Black Pudding to make a wonderful breakfast treat. Add the tofu to a pan, mash with a fork. Add the onion along with a pinch of turmeric and a pinch of bouillon powder. Season with salt, black pepper and fresh herbs as required. Good served on thick slices of wholemeal toast – nice with a veggie breakfast. Try adding chopped spring onions, spinach peppers or mushrooms. Our Lizzy is a Vegetarian Cookery school and B&B in Malvern. Where you can learn how to cook a variety of recipes in a relaxed friendly setting. Small group, hands on vegetarian cookery courses in a specially designed kitchen in beautiful Malvern. Learn how to cook simple, tasty, nutritious vegetarian meals with Lizzy, using a variety of ingredients. To see where you can buy our products or for a link to our online shop visit the Buy From section.